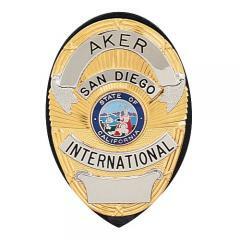 The 591 Clip-On Shield Badge Holder from Aker is a convenient and concealable way to carry shield-shaped law enforcement badges. It comes with a low-profile black clip on the reverse side that allows it to be worn discreetly on an inside-the-waistband carrier or more overtly. Its sturdy snap fastenings provide a secure hold to prevent it from being lost, and it fits a belt up to 1.75 inches wide. The carrier is made from premium cowhide leather, making it extremely durable and resistant to wear and tear, and is available in black or tan.